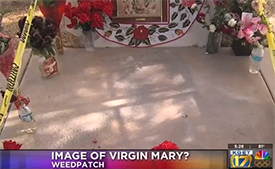 Victor Jose Alvarado was at the Transfiguration Catholic Church in Marietta, Georgia, on December 12 for the Feast of Our Lady of Guadalupe when, as he put it in a Facebook posting, “We started praying and singing songs to the Virgin Mary of Guadalupe, and immediately started feeling peace and the smell of roses!!! 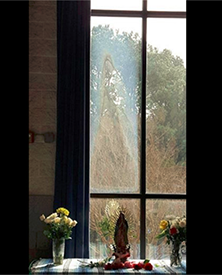 We just finished having lunch when someone noticed a very bright sun ray and in front of our eyes her image starting to appear in the window.” Father Fernando Molina-Restrepo of the church posted a photograph of the window on Facebook that shows the image of the Virgin Mary and said that while many people have their own interpretations of how the foggy figure formed – such as the pane’s coating reacting to outside elements – many viewers believe it’s their faith that is the true cause. 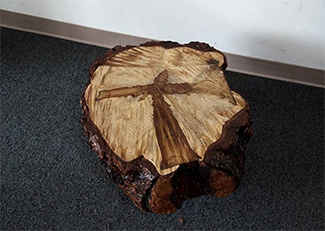 Workers were cutting down a 39-year-old drought-stricken pine tree outside St. Paul’s Episcopal Church in Modesto two weeks ago when one of them noticed what looked like a cross in one section of the log. They called church member Jim Bland who saved the section and put a protective shellack coating over it. It’s currently on display in the church foyer, though they may move it outside near a large church bell so anyone can see it anytime. 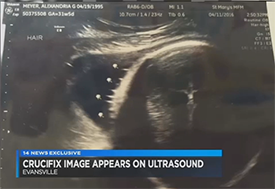 While everyone agrees it looks like a cross, Bland’s grandson viewed it a little differently. 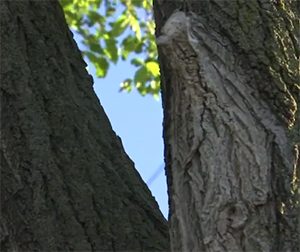 “It’s not just a cross, Grandpa,” he said, “it’s Jesus on the cross.” There’s no word on whether the workers used a rip saw or a cross cut when taking down the tree.